Jaguar Land Rover has revealed some of the new and innovative low and zero emission powertrain technologies it is researching at this year’s CENEX Low Carbon Vehicle event. Three Concept_e research demonstrators showcase this far-reaching future research, which includes a new unique high performance, modular electric drive module (eDM) developed in-house by Jaguar Land Rover. These are capable of producing twice the power and torque of any electric motor-generator in production today. These can be inserted between any engine and transmission to create MHEV or PHEV, or used alone for a BEV. 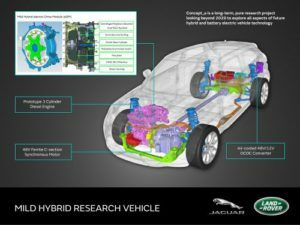 Led by Jaguar Land Rover, this two year £16.3m research project is part-funded by the UK’s innovation agency, Innovate UK1 and involves 12 UK technology partners2. It has brought together leading engineers and technologists from academia, the supply chain and industry to create a number of unique and innovative solutions. Dr Wolfgang Epple, Director of Research and Technology, Jaguar Land Rover, said: “This is a long-term Jaguar Land Rover research project exploring all aspects of future hybrid and battery electric vehicle technology. The three Concept_e vehicles will allow us to test and develop exciting new potential technologies that could form part of our low and zero emissions vision beyond 2020. Concept_e MHEV. The Mild Hybrid is based on a Range Rover Evoque donor vehicle and features a prototype diesel engine (90 PS) and a 48V electrical system. It incorporates a 15 kW crank integrated motor with disconnect clutch within a hybrid module sandwiched between the engine and 9 speed transmission. The motor-generator is powered by an advanced 48-volt electrical system and 48-volt lithium ion battery pack. Concept_e PHEV. The Plug-In Hybrid employs a similar architecture to the MHEV but with a prototype petrol engine (300 PS) and 8 speed transmission longitudinally mounted within a Range Rover Sport donor vehicle. The electric motor is capable of up to 150 kW and also takes up the function of the starter motor. The motor draws electrical energy from a 320-volt lithium ion battery packaged in the boot. The hybrid powerplant drives through the conventional automatic gearbox normally fitted to the Range Rover Sport and the full time four-wheel drive system is retained. 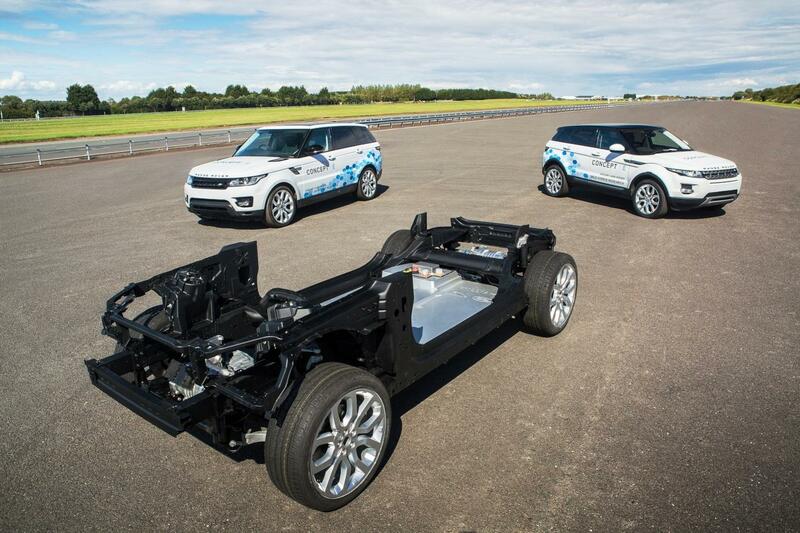 Concept_e BEV is a bespoke research demonstrator based on Jaguar Land Rover’s aluminium vehicle architecture. The underbody has been modified to mount the 70 kWh HV lithium ion traction battery and electric axle drive (EAD) units. The front drive unit features a single speed transmission coupled with an 85 kW electric motor. The rear drive unit features a twin speed transmission coupled with a 145 kW electric motor. Dr Epple added: “Environmental Innovation is at the heart of our business. We have a wide-ranging low emissions technology strategy, which has created innovations like our Ingenium engine family and lighter vehicles. Technologies like these have already helped us reduce our fleet CO2 average by 25 per cent in recent years.